Britt and I took Tristan and Addi to Rio Grande for dinner. 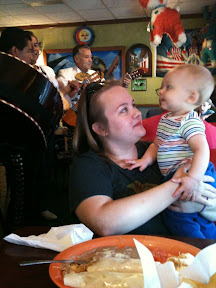 When we got there it was Mariachi Band night. 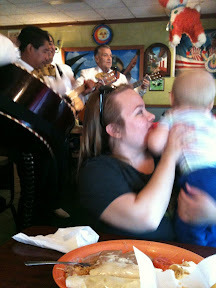 We've talked several times about going on the night when the mariachi band would be there, but we've never known when that is. Tonight was the night and Tristan loved it! He jumped the ENTIRE time we were there anytime the music started. Addi shimmied, which I always think is so cute. I recognized most of the songs they played, such as La Bamba and Tequilla. When they got to our table they did a medley for the kids of It's a Small World, the Merry Melodies Theme and the Popeye Theme. The waiters, band members and other restaurant patrons all watched him. They guitarist second from the right is smiling at him in the picture above. The band guys and waiters kept talking to him. I was joking last night at Subway that he causes a scene with his cuteness everywhere we go. I think Tristan is going to love all music, just lke his Momma. He must have some Mamaw genes mixed in there too somewhere.